we are the experts on stainless steel exhaust tips. Black Powder Coated or Black Chrome Exhaust Tips. We offer many sizes and styles for that new contemporary look for your vehicle. Give us a call for help with any tip questions! Different Trends is the leader in quality Stainless Steel Exhaust Tips. This includes Specialty Tips for specific vehicles... Camaro, Infiniti, Chevrolet Bow Tie, Challenger etc. In addition there is a complete like of colored specialty tips. Browse through and find just what you want. B&B offers a wide assortment of Diesel Exhaust Tips and Diesel Specialty Products. Tips ranging all the way from 4" diameter up to 10". Check out our inventory, most items in stock or available for fast special order. B&B offers a Different Trend Specialty Exhaust Products. Such items as custom "X" and "Y" pipes for custom work. Large assortment of truck stacks and accessories. If it's something special for that custom installation we just might have it. Different Trend's High Polished Stainless Steel Sport Mufflers will dress up any import application where there is a rear mounted muffler. 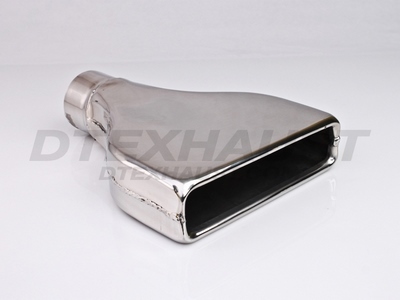 These mufflers are 100% T-409 Stainless Steel with a Mirror Like Finish. You will experience increased Horsepower, Reduced Back Pressure and that High Performance Growl of Power! Many styles to choose from and if you need help our knowledgable staff at B&B Muffler Mart will be glad to assist! Different Trend Carbon Fiber Mufflers weigh less than a fraction of steel mufflers. The space age Carbon Fiber material is long lasting and runs much cooler than its steel counterpart. These Carbon Fiber Mufflers also come in designer color wraps to accent your vehicles paint scheme. Some applications are sound adjustable!